My most recent book, Jack Fortune and the Search for the Hidden Valley, is about an expedition to the Himalayas to find new species of plants. There's lots of danger in it - precipices, rickety bridges dangling over turbulent rivers, ice bridges, journeys through leech and snake-infested jungles - all that. But I have to admit that I, personally, would run - well, stroll - a mile before taking on any of these things. Brave, moi? Certainly not, unlike young Jack. 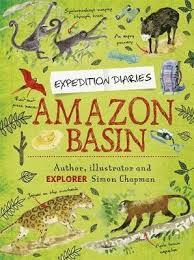 Whereas Simon Chapman, the author of this series of Expedition Diaries, is absolutely the real thing, and ready to take on the most terrifying challenges. He's an explorer - and not only that, he's an illustrator and author as well, so he not only knows, for example, what it's like to cut a path through the jungle with machetes: he can also draw a picture of the jungle, and explain what it feels like when a machete accidentally slices into your finger. Each of the books is an account of an expedition to a remote area of the world, usually undertaken just by Simon and two or three others; so there's not a huge back-up operation to come and rescue them when things go wrong. And go wrong they do; on an expedition to the Amazon Basin, for instance, a canoe skin (by means of which they plan to negotiate the remote River Enatahua in Northern Bolivia) goes missing, so the team has to improvise. They buy several small inflatable dinghies and plan to make a raft of them by tying them to a framework of poles. This sort of works - till the rapids get rough, and the inflatables are punctured, and the whole thing falls apart... And then there's the time in the Himalayas, when he climbs on ahead of the rest of the team, and they don't appear when expected - so he sits there, staring down the slope, wondering what on earth he's going to do (they have his kit) if they don't turn up. This would be a minor worry on a walk in the Lake District - but in the eastern Himalayas, miles and several mountains away from any habitation? Not so funny. The books are cleverly designed to appeal to young explorers. They're made up of short diary entries, with background information in the form of post-its, and lots of Simon's own sketches and photographs, so they're very easy on the eye and pack in a lot of information about the terrain in a very accessible way. 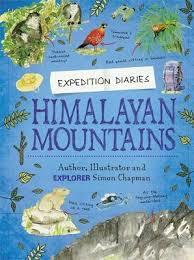 I can see my eleven year-old grandson being engrossed by them - and they would go very nicely with adventure stories set in the correspnding areas: so my book, Jack Fortune, would go well with the Himalayan diaries: Katherine Rundell's book, The Explorer, would tie in with the Amazon diaries, and so on. Here's a page-spread to give you the idea. Other books in the series are about expeditions to the Australian Outback, the African Savannah, the Indian Lowlands and the Borneo Rainforest. Good to see this Expedition Diaries review, Sue. Many children enjoy reading "fact" books - i.e, non-fiction - as much as novels - and some definitely prefer that kind of book, and more so if animals and danger are involved. I'm sure many young readers will enjoy your Jack Fortune adventure as there's lots of exploring in that story too!